The coastline of South Carolina extends 187 miles along the Atlantic Ocean. Over 50 rivers flow through South Carolina, three major rivers being the Edisto River, Santee River and Savannah River. Major lakes include Hartwell Lake, Lake Marion, Lake Moultrie, and Lake Murray. About 1,896 square miles of South Carolina are covered by water. Many of South Carolina's earliest coastal and inland settlements and towns are located near harbors and along rivers. As one of the original 13 colonies to revolt against the British, sites of military action from the Revolutionary War can be found in the state including submerged sites like the Strawberry shipwreck featured in the Cooper River Underwater Heritage Trail. As one of the Confederate states, the battle of Fort Sumter in Charleston Harbor marked the beginning of the Civil War. Two well-known shipwrecks found in Charleston Harbor are the Confederate submarine H.L. Hunley and the USS Housatonic, which was the first ship to be sunk in battle by a submarine. The H.L. 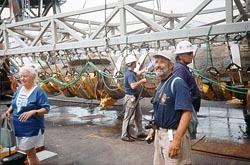 Hunley was recovered intact in a cooperative venture by the Naval History and Heritage Command, the South Carolina Institute for Archaeology and Anthropology, and others. Once conserved, it will be placed on permanent exhibition in South Carolina. Other sites found underwater include sunken sailing ships from colonial times, 19th and 20th century barges, steam tugboats, wharves, and ferry landings. A few of these sites are featured in the state's underwater trails on the Ashley and Cooper rivers. Another example is the Brown's Ferry Vessel, a schooner-rigged, flat-bottomed inland transport vessel thought to have wrecked in the first half of the 18th century in the Black River near Georgetown. This vessel was carrying a cargo of nearly 12,000 bricks. The site was excavated, documented, and raised by the State, and the conserved vessel and artifacts are on permanent exhibition in the Rice Museum in Georgetown. Who takes care of South Carolina's underwater archeological sites? South Carolina is one of only a handful of states that employs a State Underwater Archeologist. Working out of the South Carolina Institute of Archaeology and Anthropology, the State Underwater Archeologist oversees and implements the State Underwater Antiquities Act; maintains a research database of state underwater archeology sites; and conducts and oversees underwater archeological studies determined to be in the best interests of the State. The State Underwater Archeologist works closely with the State Historic Preservation Officer to ensure that all underwater archeological research and resulting reports carried on in State waters by any individual, organization, or other entity is adequate and meets professional standards. A Hobby Diver License allows temporary, intermittent, recreational, small scale, noncommercial search of submerged archeological resources and recovery of a limited number of artifacts. A maximum of 10 artifacts per day may be collected from a site, and only artifacts that are recoverable by hand may be collected, meaning the artifacts must be exposed on bottom sediments and not require excavation or tools of any kind to recover and bring to the surface. No ship timbers, fittings, fastenings, or machinery may be moved or removed from the site. All Hobby License divers must file a quarterly report of activity including certain information about any artifacts collected. Artifacts collected by a licensed hobby diver and reported on the quarterly report to the Institute may be retained by the collector after the state has studied and evaluated them. An Intensive Survey License allows intensive survey for the purpose of delineating the boundaries of a specific location which may contain submerged archeological resources. A Data Recovery License allows data recovery on submerged archeological resources. Applicants for a Data Recovery License must submit positive results of work conducted under an Intensive Survey License for the same location, and documentary archival evidence, electronic remote sensing data, and/or artifactual data that demonstrates the presence of submerged archeological resources. No license is required to inspect, study, explore, photograph, measure, record, conduct a reconnaissance survey, use magnetic or acoustic detection devices, or otherwise use and enjoy a submerged archeological resources if the activity does not involve excavation, destruction, substantive injury, or disturbance. Are there any underwater parks in South Carolina? The state has established maritime heritage trails for the enjoyment of both divers and non-divers. The two-mile long Cooper River Underwater Heritage Trail highlights six shipwrecks, ferry landings, and docks from as early as 1705. The six-mile long Ashley River Paddling Heritage Trail highlights eight shipwrecks and wharves ranging from colonial times to the 19th century. What laws concern underwater archeology in South Carolina? Relevant state laws include the South Carolina Underwater Antiquities Act of 1991 codified in Title 54, Chapter 7, Section 610, et seq., of the South Carolina Code of Laws and laws about the South Carolina Institute of Archaeology and Anthropology codified in Title 60, Chapter 13, Section 210, et seq. These laws emphasize that submerged archeological sites are a nonrenewable and finite resource, and that their conservation and preservation is of the highest priority to the state.